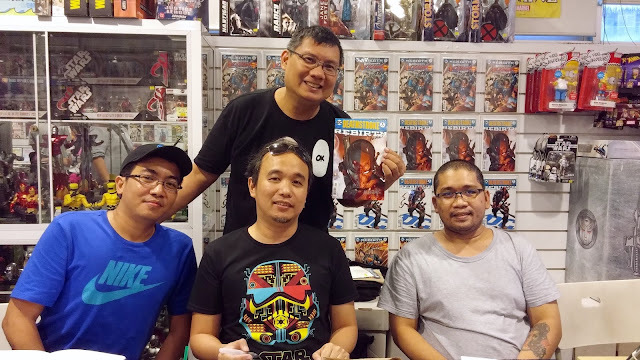 Last Sunday, August 14, Filipino comic book artists Carlo Pagulayan, Jason Paz, and Stephen Segovia signed copies of their latest works at Comic Odyssey inside FullyBooked at Bonifacio Global City. All three artists had new first issues for DC Comics Rebirth line with Pagulayan and Paz tag-teaming on “Deathstroke" while Segovia pencilled "Action Comics". That all seems forgotten now as the publisher’s line-wide “re-boot”called “Rebirth” (the second time they are using that tag) has garnered rave reviews for its seemingly back to the basics and “nostalgia” approach. 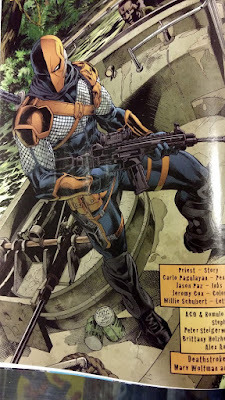 The comic “Deathstroke” is about Slade Wilson, the world’s most dangerous assassin and mercenary who was introduced in the pages of "The Teen Titans" back in the 1980s. Pagulayan and Paz are tending to the art chores and bringing to life the prose of acclaimed writer Christopher Priest. “With ‘Deathstroke’, my interaction with the writer is discussing how I envision the action scenes and the designs for certain characters,” described Pagulayan of the work process. The veteran artist who hails from Batangas is probably best known for his work on the “Planet Hulk” storyline on the “Incredible Hulk” title for DC’s chief competitor, Marvel Comics. Pagulayan is signed up for five issues of “Deathstroke” — issues 1 and 2 and Nos. 6-8. “The book is on a bi-monthly schedule right now and I am okay with that. If it were monthly I will be unable to get them out on time. So after the second issue, another artist will take over and both Jason and I return by the sixth issue. Beyond the eighth issue, I don’t know what’s next." Several dozen fans braved Sunday’s inclement weather for the signing (while some 50 other fans left their copies to be signed by the Filipino artists). Comic Odyssey reported that their entire orders for 100 copies of “Deathstroke” sold out.